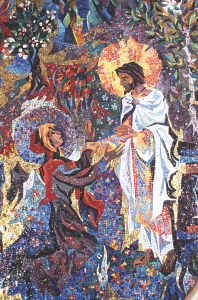 Mosaic of Mary Magdalene and Jesus by Rowan and Irene LeCompte found at the Washington National Cathedral. Photo credit: Washington National Cathedral. During our visits to Venice Beach, my mother would sit high on the shore line with my sister and me and dig a shallow hole; soon enough the ocean would fill the hole with sea water and leave behind a tide pool filled with small Pacific creatures. She would point out tiny translucent bodied crabs, sea shells, and the mysterious trail of bubbles left behind by the little Donax clams that I was never quick enough to witness burrowing down into the sand out of sight. My mother would quickly scoop out a handful of gloppy wet sand and with her hand gently closed, swish her fist back and forth in the tide pool rinsing the sand and leaving behind the little clams. They were an amazing revelation to my 5-year-old-self. No bigger than my mother’s thumb nail and in every color of a California sunset, there they were vibrating in the palm of her hand. After the mysterious signs of the Donax clam were decoded, I saw them every time I went to the beach. In fact I couldn’t help but notice them, they became part of how I understood the landscape and experience of being there. Over the years as I’ve watched my own children make discoveries that expanded their understanding of the world around them, I remember this story. Indeed, in my own life, I think of the small wonder of the Donax clam and it reminds me of the intricate miracles of God’s creation that must be right in front of me. There is a complex web of all that is seen and unseen, that points to God’s plan and nature, but my ignorance and inability to see, keep most of it a mystery to me. In the letter to the Romans Paul says, “Ever since the creation of the world [God’s] eternal power and divine nature, invisible though they are, have been understood and seen through the things he has made” (Romans 1:20). Certainly the order, complexity, and sheer loveliness of creation should compel all humans to ask, “From where did this universe come?” But if we’re honest, it’s easier to gloss over the puzzling in favor of the familiar and easily comprehensible. The key to seeing and understanding God is the miracle of the resurrection of Jesus Christ. It is tempting to reconcile the supernatural wonder that is God’s salvific work entirely through the mechanism of the cross, but we cannot stop there. We must continue on to the mystery of the empty tomb. I think the same instructions are helpful when contemplating the resurrection. When we examine the resurrection narratives in scripture we see the same process Oliver describes in her poem. The disciples become aware of a new reality; they are transformed in amazement; and finally they proclaim the discovery to others. When Mary Magdalene visits the tomb in the gospel of John she goes with a particular understanding of reality. Jesus is dead. Because she believes this is true her understanding of everything is defined by the finite boundaries of death. Her hopelessness is so complete that even when she encounters an empty tomb and speaks with angels, she still grieves. I once had a pastor that referred to the people of his church as Easter people, and in his benediction would say, “Go out and live resurrected lives in the resurrected world.” Easier said than done. The brokenness of sin is also part of our reality and sometimes we simply pay closer attention to that, rather than the signs of resurrection all around us. Life in Christ isn’t a guaranteed painless existence. A few years ago my husband, who is an elder in the United Methodist Church, and I packed up house and prepared to move to a new church community. Through a series of missteps, miscommunications, and some truly bizarre moments, the new church appointment fell-through on move day. It was devastating. The season that followed was more than a year of working through the fallout of that event. I, for the first time in my life, indulged in deep, unchecked bitterness and it infected everything. 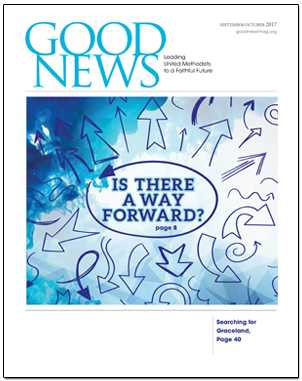 In that season the Lord provided so much for me personally and for my family and while I was grateful to see signs of my children and husband’s recovery, I rejected the portion of goodness the Lord had for me. A year and a half later, I was having coffee with my husband, the heaviness of that day still hanging over me. My husband looked at me and said, “Maggie, I miss you.” That simple statement woke me up from the pervasive lie that one bad day came to represent about my life, to the reality of God’s abundant grace and compassion that was actually all around me. My favorite moment in John’s resurrection narrative is the moment right before Jesus calls Mary’s name. The burden of her grief is devastating. She is blinded by a false reality of death. She goes to Jesus believing him to be the gardener and begs for the body of her Lord, “Sir if you have carried him away, tell me where you have laid him, and I will take him away” (John 20.15). Her understanding of reality is so certain. Mary falls to the ground astonished, crying out “Rabbouni!” which means teacher. This response is hardly surprising for us reading the story. If I saw someone I believed was dead standing in front of me I’d fall down too! However, there is more than just surprise at work in Mary’s actions. In seeing the resurrected Christ her vision of reality is snapped into alignment with truth. This knowledge inspires awe and reverence. Teacher, she calls him, and he is, but not only of scriptural insights. The factual truth of Christ’s resurrection teaches Mary and all of us, the deepest knowing of self and God that is possible this side of Heaven. We cannot expect to understand the importance and grandeur of the resurrection if we are determined only to see the world in terms of the finite and manageable. I understand the temptation to do so; my five-year-old-self was certain I would never see what caused the rising stream of bubbles from the tide pool floor. But my mother came beside me with a greater knowledge and wisdom of the world to help me see, if I allowed her. Humility is required in the practice of astonishment. We must learn that there is a Lord. We are not the Lord. And we need the Lord. If we, rather than Jesus, are center of, and master over our lives, then nothing surprises us. We slog through the world searching for dead bodies, and sin does not disappoint us. Our only recourse in that kind of life is to give over to the false wisdom of cynicism, of knowing how all will end before we ever begin our journey. What then, do we make of a story like the resurrection? Well, it’s a good metaphor for self-improvement. Shouldn’t we all want to be better and do better? No! In that paradigm God and all of God’s creation is only as good as he and it are useful. But God’s existence and graciousness are not dependent on a practical cause. God is goodness. God is beauty. God is love. God is. Every bit of his creation without exception is imbued with this essence. He immediately charges her, go back and tell the other disciples. If we pay attention and see the Lord, if we are astonished by his goodness, beauty, and truth, but tell no one, we feast at a banquet meant for all – yet eat alone. It is entirely possible to follow the Lord our whole life and never tell anyone anything substantive about our life in Christ. It is entirely possible for a body of people who call themselves a Christian church to witness to everything under the sun – except the resurrection of Jesus Christ, upon which rests the veracity of every single claim of Christianity. Christians face some challenging cultural circumstances these days, but we must have courage in our identity in Christ. Telling someone, even someone with whom you attend church, that you actually believe Jesus died, was buried for three days, and then was resurrected, is bound to provoke some confused responses. That’s okay. The gospels present a variety of responses to the testimony of Christ’s resurrection and none of them are immediately affirmative. As my baseball loving Dad says to me when I worry about how something will be received, “Don’t focus on the batter; just give your best pitch.” This is true for how we witness to the resurrection as well. The more we live and tell of this sublime reality, the more confident and more compelling we become. We will see more deeply, and reverence more ardently, and tell more freely of God’s rescue through the cross and our new life in the resurrection of Jesus Christ. Others, who do not yet know to whom they belong will be drawn to our joy. Christ tells Mary to go back to his brothers and tell them an amazing mystical truth: “I am ascending to my Father and your Father, to my God and your God” (John 20.18). Can’t you imagine her running like she has never run before in her life? Taking the stairs two at a time, out of breath, and barging into the room where the reality of death still reigns? She looks around at these, her fellow disciples, the people who will tell the story she is about to tell them, to the world. 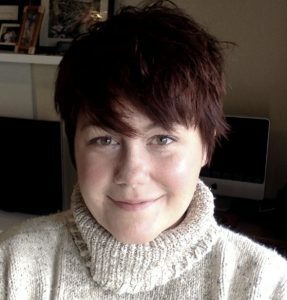 Maggie Ulmer is one of the hosts of the Plain Truth: A Holy Spirited Podcast. She holds a degree in Classical French Cuisine from Pennsylvania Culinary Institute, is the co-founder of a professional theatre company called The Hub Theatre, and is married to a United Methodist pastor. This was a lovely essay. Just what I needed to read!